'0 Through 9' by Jasper Johns. The Broad Museum continues to distinguish itself as a high cultural center by providing a softer form of the Athenian Agora upon the hills of the city centre of Los Angeles, for the common man to be brought closer to the truth – or something resembling it! In this exercise of advancing the spiritual in mankind, we have a cornucopia of art – mostly from private collections – of the famed Jasper Johns. The fame of the artist is well-deserved. He has, most prolifically, taken the challenge of creation amidst the vacuum of the transcendent in Western culture, i.e. facing the abyss amidst the death of God, and positively moved the art of fine art forward. He has done so in such an eclectic manner, as has been exhibited, that the cliché breathtaking finds its Platonic source in this collection. Mr. Johns has best advanced the idea of what art can be, i.e. what is beautiful, by being so brutishly cerebral in his works. This is best represented by his wonderfully copious use of industrialized goods, resonating with Warhol but reaching a higher octave because of his greater brilliance than a mass cultural icon. He in other words imbues the junkyard debris, the waste of human industrial productivity, giving these artifacts sacred elevation. I must be clear here that Warhol is not contemptuous with his playthings, only that whimsy can only take art so far – and this comes from a critic which demands the sweetness from humor to be syrup-lacquered over a canvas. There is, therefore, a time when art needs to be taken seriously, to fine tune the soul’s inner song notes with what is not simply true, but what is grander than truth – the Divine. This is best represented and worthy of meditation with his Field Painting. For in Johns’ other works of fine-art industrial craftmanship, the use of man-made objects supplement, if not augment, the canvas. In this work, it takes center-stage entirely, if not dangerously idolatrously. And we would only judge such a work as idolatrous, as a pagan artifact of worship, if it was so cavalierly treated so by the artist and his audience. Indeed, perhaps such a work placed randomly in the Amazon mysteriously found by an isolated tribe of man may treat it as a supernatural object. But why? It has, so well-composed, the coalescence of the unseen order, of the transcendent. It possesses the appearance of logos, of a definite fulfillment by an intelligent being, yet the order itself is inarticulable. We are left in a sea of mystery: what is its purpose to being brought into creation, into this world? The question, of course, does not end at the limits of the canvas, or even of the museum itself. The struggle to find meaning or reason for being is a fundamental attribute of being man. For with contingent freedom, with our bounded creative agency, we are perennially seeking what we must will properly. The vexation is the uncertainty, perennially too, of the answer. Field Painting does not have an answer, it does not seek to impregnate the public with resolution but curiosity of existence. And with this mid-century spark-plug of intrigue, Mr. Johns succeeds fabulously. This work is a testimony to the comfort Mr. Johns has with working with mystery. He is akin to a shaman, conjuring not sorcery to control mankind, but enlightenment. In all of his works in the exhibition we do not see any vague sense of the political, merely the aims at transcendence accomplished in Johns’ own uniquely creative possession. Sometimes his works come titled, as if he is able to gather what his finger-pulse on the creative powers of the cosmos measures. Other times, his works are left with barren names – not reprehensible in the grander scope of the artist and his wrestling with the unknown order being. Sometimes the artwork is left cold, lifeless, austere – as if suffocating the lightness in the soul of every person who touches the art with their eyes, drawing them inward seductively to then be reverberated with the most common question in every private mind: why? Other times, there is starbursts of color, a childish dance with paint on the canvas – another angle of attack as it were in promulgating the same question. And I cannot even speak to his eclectic media use which is dauntingly successful. There is such an abundance of artistic achievement in ink, in paint, in bronze, we have an unequivocal universalist which succeeds in his art’s aim: for something resembling truth. 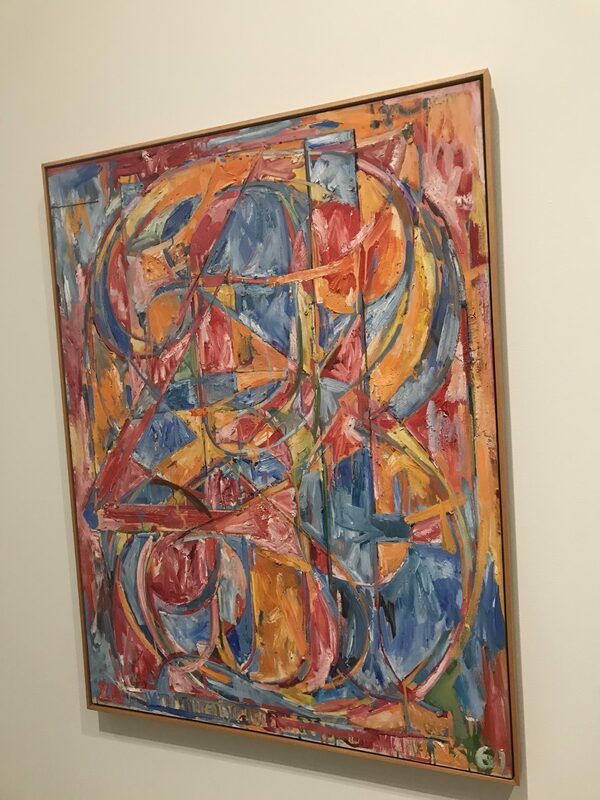 While existence is mysterious it can be known that in short, it has been made better, it has been edified, with the existence of Jasper Johns.